This morning I woke up way too early, I had issues falling asleep I saw a movie at the theater later than I would typically go and couldn’t get my brain to quiet down. I woke up this morning feeling like I slept in a twisted position, neck and lower back had knots. I waited until 8am to start making my breakfast, a Banana Shake. There were especially few ingredients for this one and all of them are affordable and things many of us would already have in the house. It may be took me 5 minutes to measure, cut, rinse the soaked nuts, and to blend everything up. 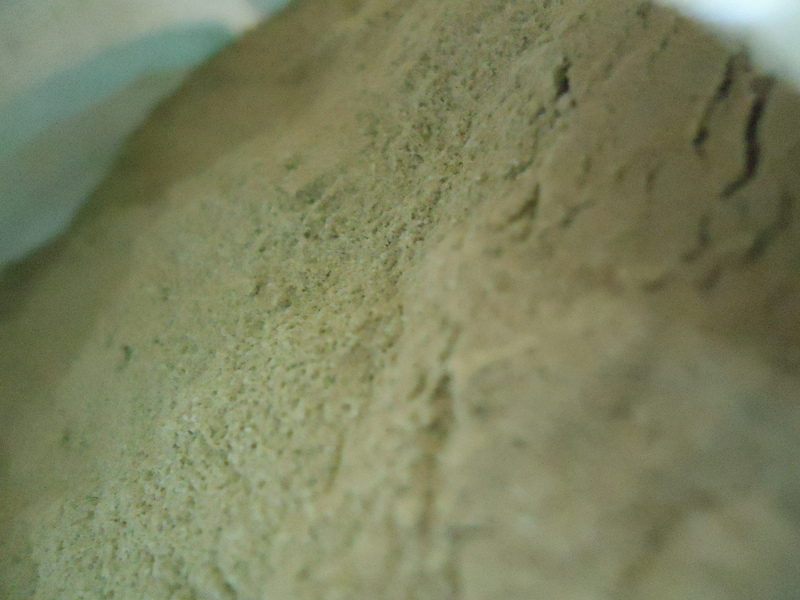 Matcha is alkalizing, energizing, detoxifying and rejuvenating. It’s high in amino acids like L-theanine aiding to improve cognition and mood while reducing physical and mental stress. While cleansing or dieting one should try to have the least of amount of stress possibly (easier said than done I know) because when the body is stressed it stores fat. Matcha is high in anti-oxidants that assist in strengthening the immune system by protecting the body from free radicals. If you like your shakes thicker I recommend freezing the banana over night. First peel the banana, cut it into pieces your blender can handle then store it in a bag or plastic container. Frozen banana makes smoothies and shakes larger in quantity and can help you feel fuller. Overall, the taste in this one is amazing but may be it’s because I have always found comfort in a banana shake. 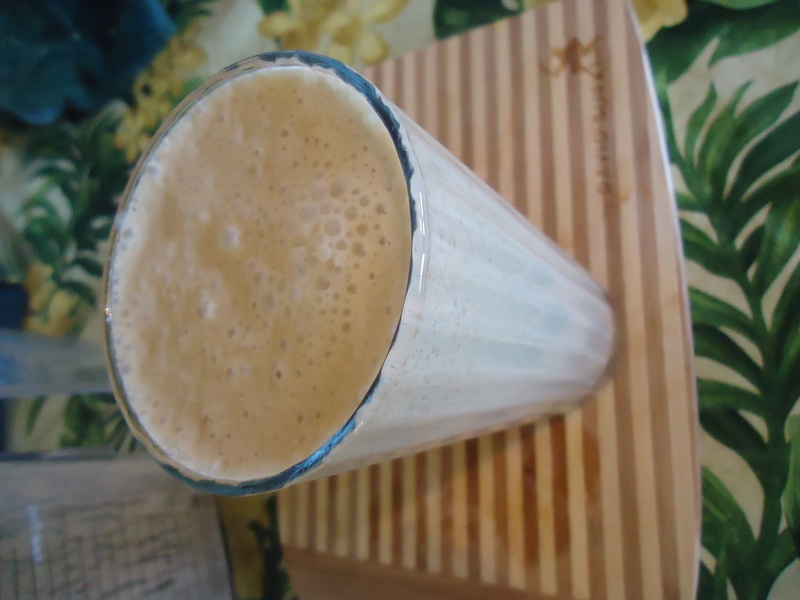 This is a great recipe to share with friends and family, they may be surprised at how tasty and good for them this is compared to a normal banana shake or smoothie. After going for a 40 minute run and doing lots of cleaning around the house (very therapeutic while cleansing) I was ready for a snack & for something with some anti-inflammatory benefits! Yesterday I wasn’t hungry enough for one, and the planned snack for today asked for pomegranate which I can not find around town. So instead I had yesterday’s snack, Grapefruit Salad. This salad has cinnamon & ginger, great anti-inflammatory ingredients. Instead of silvering ginger I minced it, I prefer the texture and how it spreads the flavor. 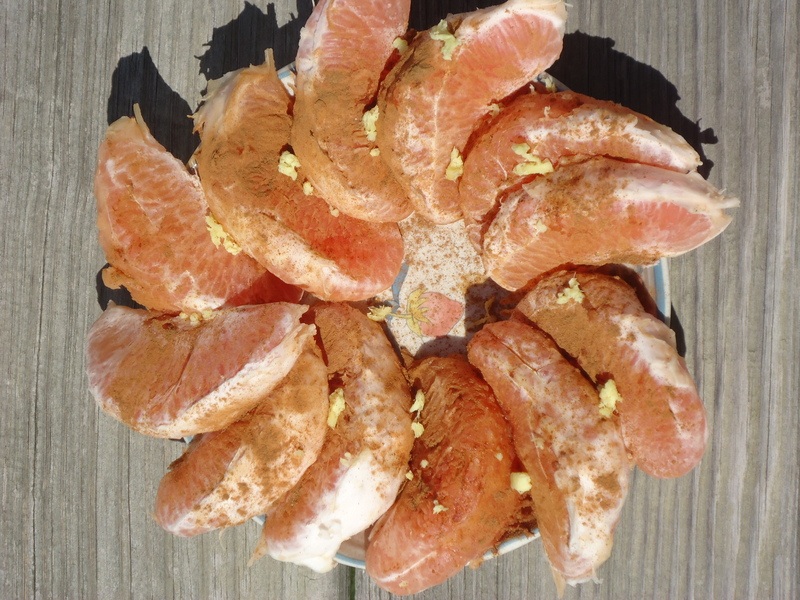 I purposely put cinnamon & ginger in the center of my plate so I could dip my grapefruit slices if I didn’t think a piece had enough of the toppings. While cleansing it is normal to feel aches in your body, or feel like your energy is off. Cleansing pulls out toxins and even mental build up in your body. It is even common to feel the pain from a previous injury. I will be going over this in more depth in my second post. There is a Pineapple Protein Shake as a snack for this afternoon but I’m still full from lunch. 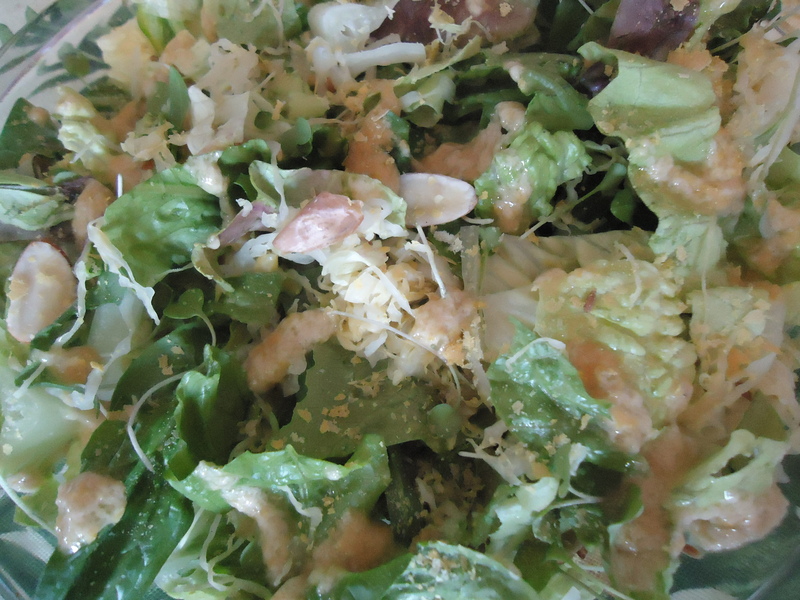 For lunch had Spring Sauerkraut Salad with Thermo Dressing. I really wasn’t happy to see that this recipe uses a lot of oils, before doing this fat blast I was on a kick of not using any oils or may be using them once a week if need be. The thermo dressing was nothing to rave about. But it did go well with the salad specifically the sauerkraut. The recipe calls for spring mesclun mix or your favorite greens. I already had red leaf lettuce, spinach, dandelion greens, and romaine in the house so I used a mix of that instead. I sliced the almonds because I prefer pieces of almond than whole almonds in my salads. If I had sunflower seeds around I would have used those instead, it compliments the dressing & salad much more. For the Thermo Dressing I added the “Fat Melter” in the blender. I also used the ” ‘Bot Booster” but sprinkled that on top instead for appearance and texture.This salad is another one that is filling to the point that I wouldn’t feel comfortable exercising for over an hour afterwards. If you ever do not feel full with solid foods try focusing more on eating. What I mean by that is have no distractions while you eat, no tv, do not talk on your phone, do not read, just try to look at every piece of food your fork picks up and focus on chewing your food. Chew your food to the point that it’s pretty much a liquid. Think about the texture, flavor, how you feel, keeping your jaw relaxed, how your teeth or tongue feel, how things start tasting differently when they are completely chewed and broken down. Processed foods like bread, cheese and so on would never taste this good if they were completely chomped down on. It would start tasting like chemicals, or you can’t really describe the taste as well as whole foods. Today I feel even more inspired to form a type of community here on my website where people who are vegan, carnivores, processed food junkies and so on can come and feel safe. Eventually I would love to take this further and have an actual physical place for people to visit. A space for people to openly talk without confining themselves to how others would “want” them to think. A community with tolerance and acceptance for where anyone is in their life right now. I haven’t been doing well, once again, with consuming enough water. I’ve tried so many different tricks I know but I’ll have to try harder. Please stop by later tonight for my dinner post and a brief conversation on cleansing (how the body & mind feel). If you are looking for more ways to cleanse yourself check out some of my previous posts on oil pulling, Tampico brushes, tongue scraping, hot water with lemon and juice cleanses/feasts. Much love ❤ and raw power! Supplements. Vegan Collagen & B12.